When you decide to add outdoor furniture to extend your living space to your deck or garden, there are many considerations when choosing your furniture. Outdoor furniture that is both functional and beautiful is becoming increasingly popular, out is in. Pieces are not only more stylish than ever, but also more finely made, and more all-weather materials are available to craft a whole new range of looks. Unconventional styles and innovative materials will add personality to an outdoor space. The styles of outdoor furniture can range from warm contemporary to the more traditional look of wood or wicker. Traditional accent pieces from etageres to bars, traditionally reserved for indoors are now making their way outdoors. 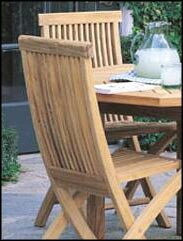 Bamboo is also becoming a popular material for outdoor furniture. Tables for six are becoming the norm while tabletops are being designed in a greater range of materials than ever before  from mosaic and marble to lavastone, tile, granite and punched metal.